Not sure how, but we did. 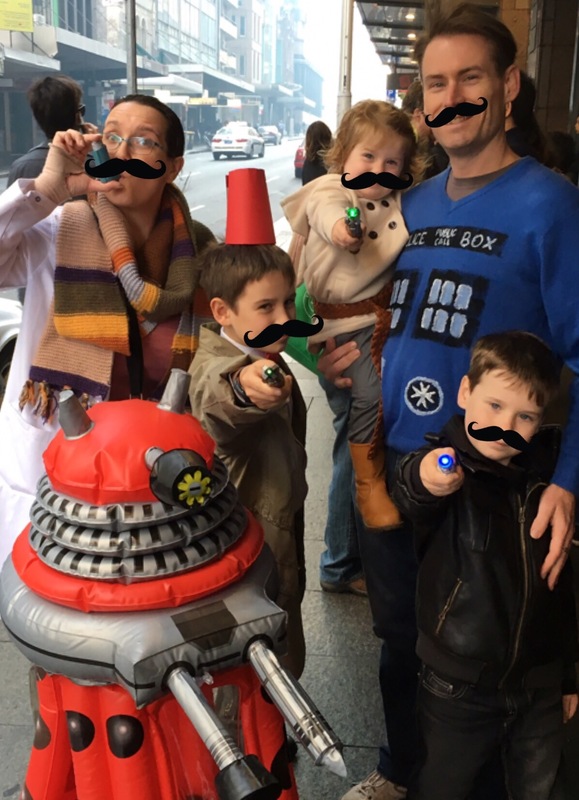 For those playing at home, EG Inc cosplayed with a Doctor Who theme: 9th Doctor; 11th Doctor; River Song; Osgood; and of course, the TARDIS. The Dalek is a bonus, given to us by family a few years back. Yes, it’s ride-in for a small child. No, you are not small enough. I love the cosplay. It’s just simple fun. It’s dress-ups for geeks, but it’s not a game. It’s a community. A nod to anyone’s fandom. But I noticed something that this year’s FCBD (Free Comic Book Day): there was less cosplay then previous years. We had a little game in the car on the way to Kings Comics. 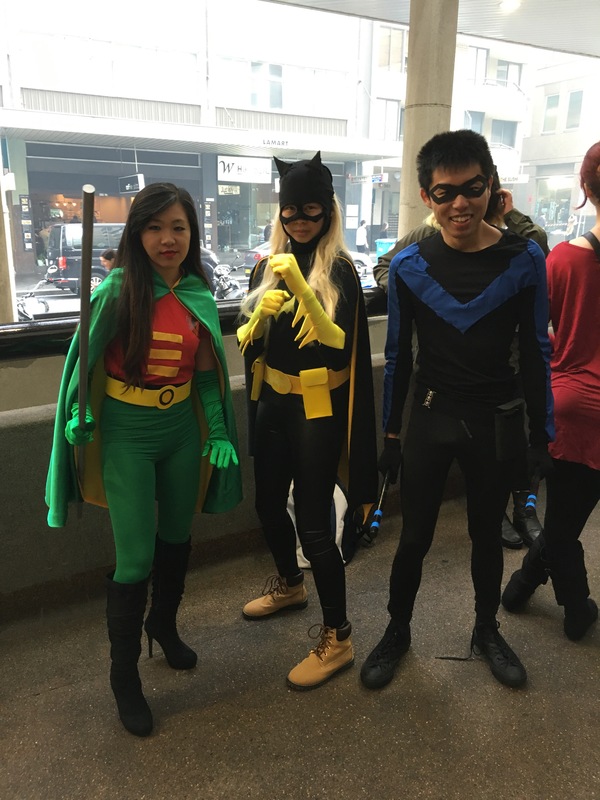 I said I would see 5 Batman-cosplayers in the queue for FCBD. Sinister said 6; Nefarious said 4. And I saw one Iron Man. And one Captain America. Don’t get me wrong; there were some awesome contributions. But the pool was running a little dry this year. I had a chat with staff at nearby Kinokuniya and they had also noticed a difference, albeit more pronounced at Kinokuniya. When we first came across FCBD in 2010, there was a great community of cosplayers working with the stores as part of the celebrations. There were storm troopers (501st? ), Trekkies, and a guy with a full-size Dalek. There was chatting about the comics on offer, discussions about artists involved, and a general positive air about the whole event. 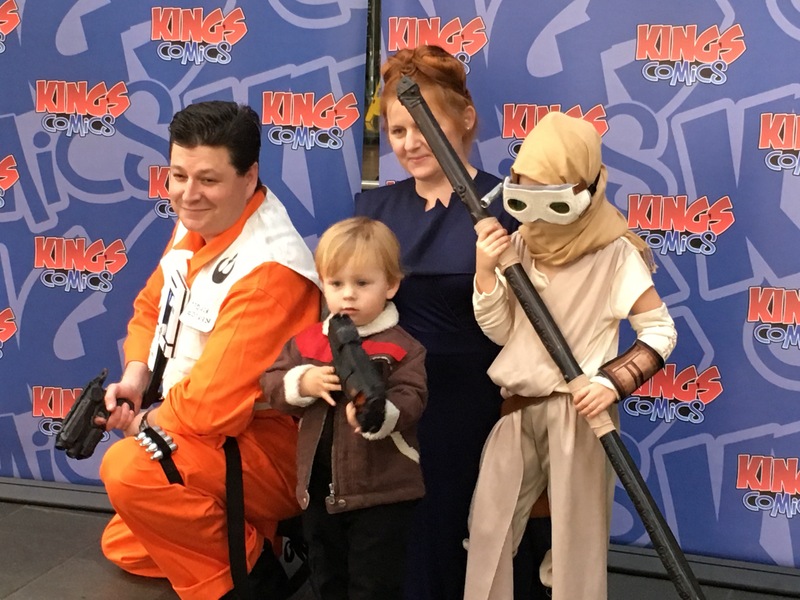 FCBD is about promoting comics and reading for everyone – it’s not just reassuring established geeks, but inviting new readers to the genre. How to fix it? I don’t know. Like I said, Kings still had it – but they were putting on a huge birthday party as well. They also have a different community: they are still a local comic bookstore (a large one, but still a ‘local’). They also have a great family focus for the day; plenty of activities and interaction with the kids. Kinokuniya is a bookstore which has a pretty good comic selection… And a bigger manga section. 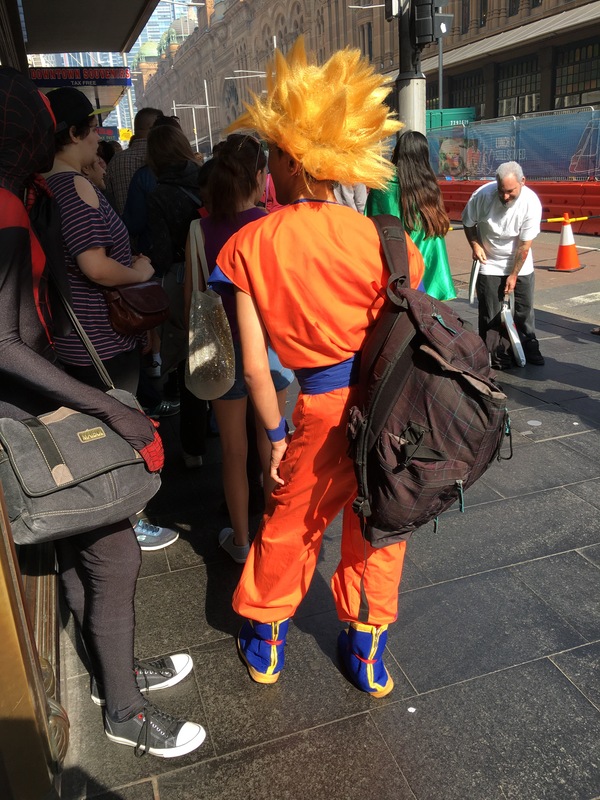 The majority of cosplay who turned up at Kinokuniya were manga-inspired. But a good chunk of them didn’t even go upstairs to the store. They were just hanging around downstairs in the foyer. There’s not a problem with this – I like the mix. But I wonder this the telling difference between the two. And will this continue to reflect on future FCBD? But enough about the cosplay and stores – what goodies did I pick up? In the freebies: Lady Mechanica; Serenity; Mooncop; Spectrum; Pokemon; Dream Jumper; Doctor Who; Science Comics; Darkhorse All Ages; and DC SuperHero Girls. We also bought Gwenpool #0, a 9th Doctor comic, and my favourite: a signed trade copy of Black Magic. Nicola Scott was at Kings today. I’ll be sharing my chat with her over at GeekMom shortly. Whatever happens at my end, make sure you go out and enjoy YOUR FCBD. That vibe I was talking about? It comes from YOU. This entry was posted in Managing Evil Genius Inc. and tagged cosplay, FCBD, Kings Comics, Kinokuniya. Bookmark the permalink. We went to FCBD in Wollongong for the first time this year. Our local comic store hasn’t even been open 12 months yet, so it’s probably their first too and I was guessing it could take a year or 2 to warm up. Most of the cosplay was by the staff, and a guy in an excellent Deadpool costume that was standing in front of a screen so people could have their photos taken with him. My daughter was disappointed that when he took his mask off he wasn’t ugly at all. I think she was expecting a mask under the mask? We didn’t go in cosplay ourselves, although my daughter got several compliments on her retro pixelated Ninja Turtle T-Shirt. Next week in Wollongong is ComicGong, and we haven’t quite finished our costumes for that yet. Next year we’ll have to plan ahead and get two weeks out of one costume! In fact straight after FCBD we rushed home to keep sewing and then had a crisis because our fabric glue idea totally failed. This morning I was out buying fabric paint – which will – touch wood – work instead??? Only panicking a little… We actually got a pile of comics because we did not realise it was a limit of 3 each… No-one told us! We just overheard it as we were leaving with a bag full of comics and it was too embarrassing to try and put some back… Being a manga fan I was happy to see One Punch Man in the offering. We already own most of One Punch Man’s manga, so we didn’t pick that one up. Just good to see he’s getting to a wider audience. I didn’t see Lady Mechanica, which I was looking out for after your suggestion, but considering we got 17 comics between 4 people I think we did just fine (even though one was Grumpy Cat). The kids saved their money from the school Mother’s Day Stall (because it as all rubbish Mum) and instead bought HellCat #1 and Rocket & Groot #1 for me for Mother’s Day. They didn’t have the next Squirrel Girl I was after, and surprisingly Pop Vinyl does not have a Squirrel Girl yet, so that was two present ideas out the window. At least the kids know me better than to get me soap or candles! I am soooo looking forward to seeing your cosplay for the next cosplay. And tell your daughter I completely understand the disappointment about the Deadpool. That’s just breaking the magick!! We were just thinking about going to Supanova and/or Comicon in Sydney – to get the most out of this cosplay which has been a rollercoaster to create. What day are you at Supanova? I’ve never met someone I’ve “met online”, but after Harry Potter cushion moved in, my kids think you’re my best friend already 🙂 More incentive to get on the train to Supanova!